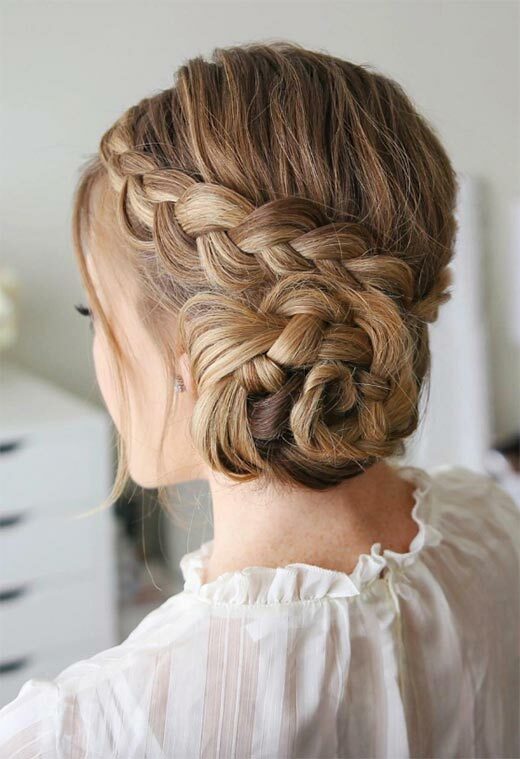 With summer starting, braids for long hair are the perfect way to keep cool! 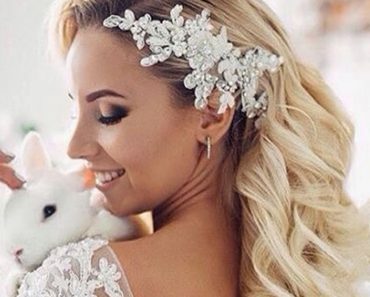 Whether you’re planning on attending all the cool music festivals, or you have a series of weddings lined up, braided hairstyles for long hair will make sure your hair does not get in your way from having fun. 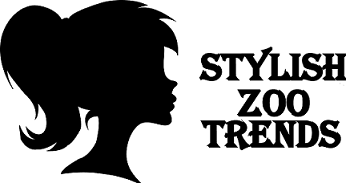 Braids for long hair can be loose, chunky, and haphazard for a more bohemian look, or they can be kept very clean or twisted into buns for sophisticated evening events. You can even add just a few tiny braids for texture, leaving the rest of your long hair loose. No matter your proclivities, you can make long braided hair fit your personal edge. To get your inspired to play around with twists and turns, we’ve collected all the best inspiration for long braids. 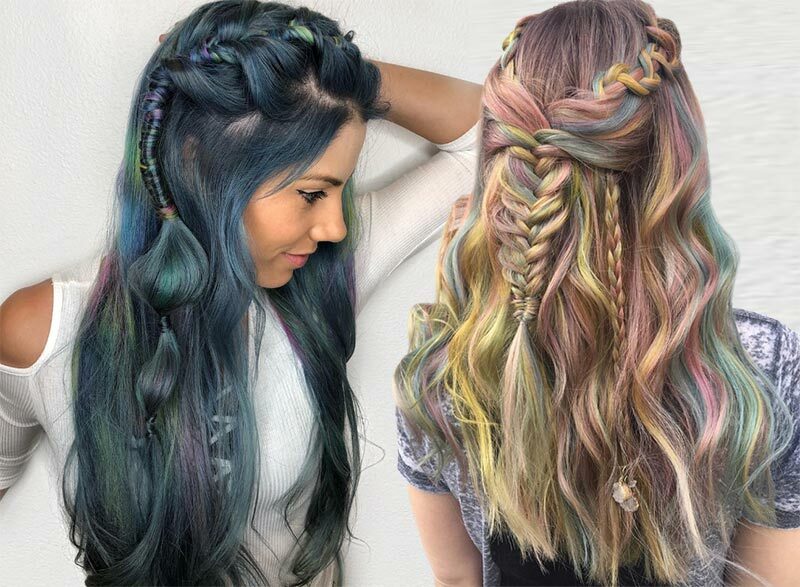 Let us know which of these long braided hairstyles is your favorite! This thick and chunky braid is a perfect spring styling choice for long hair braids. It’s super messy and large, which means it would require some pinning to keep in place, but it’s so beautiful, so isn’t it worth it? 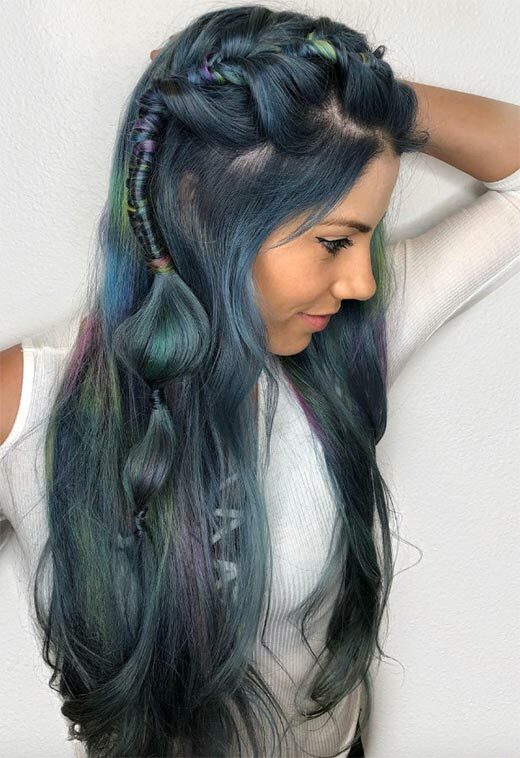 This fun look has a lot of wisps and loose strands, as the braid is only at the very center of the back of the head. 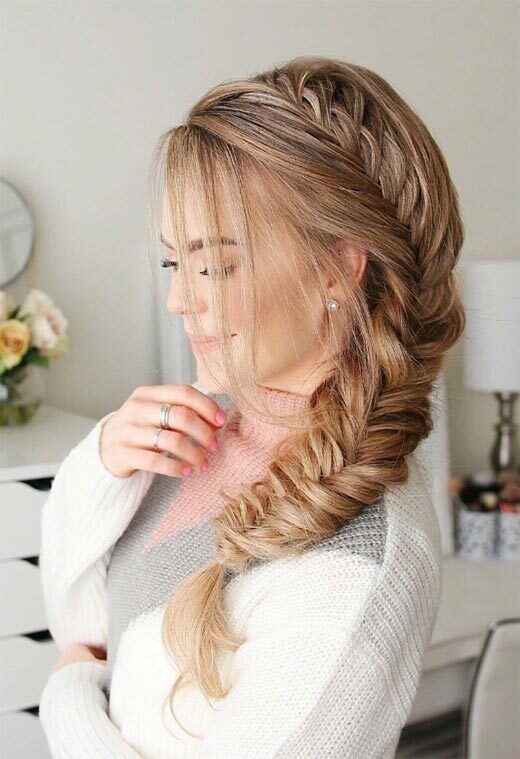 This is one of those braided hairstyles for long hair where it starts off as a Dutch braid, but is then transformed into a fishtail braid rather than a traditional braid, for a textured look. 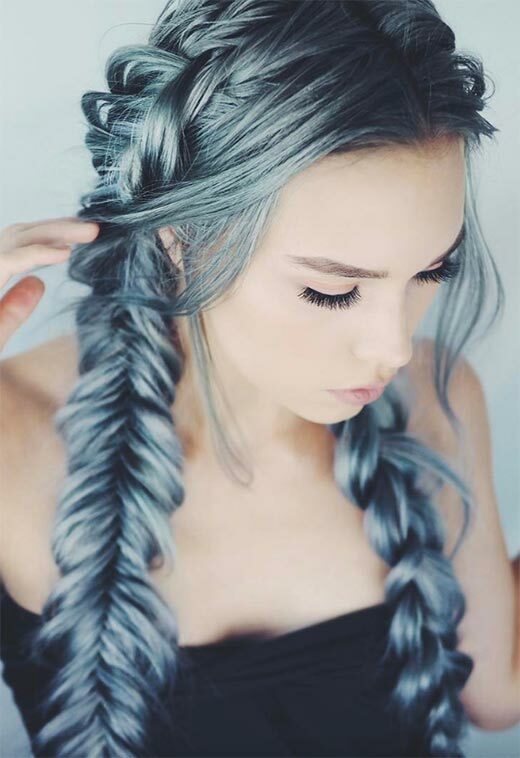 Chunky long hair braids go perfectly with funky hair colors like this gorgeous icy blue. Here we have double Dutch braids that become fishtail braids once they get past the head. 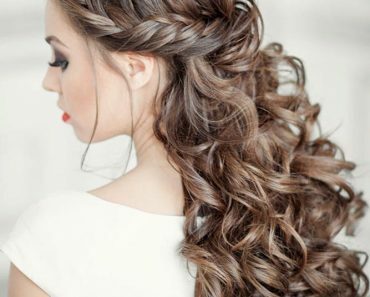 Some long braided hairstyles scream summer or spring wedding, and this is certainly one of them. The lace braid along the side is crafted with careful weaving, and ends in a delicate bun at the nape of the neck. 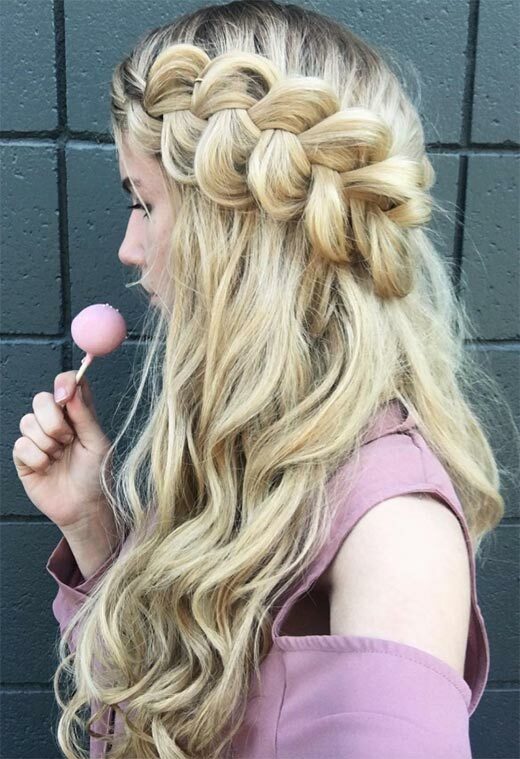 To get this kind of gorgeous long braided hair, you’ll have to split your hair into two parts, and Dutch braid each side. 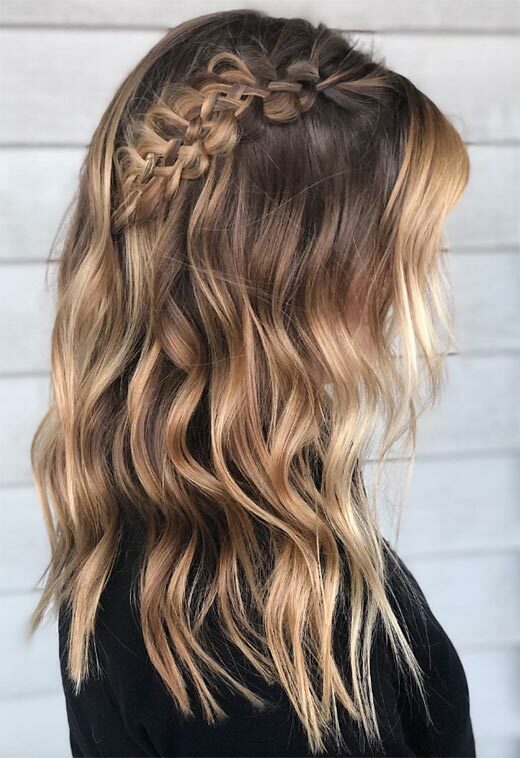 Have the two braids meet in the middle as a sleek ponytail for a totally unique summer hair look that shows off a great balayage beautifully. It’s super fun to decorate braids for long hair with fun accessories like the scarf in this photo. This is a semi-braid, with most of the hair loose that starts as a Dutch braid and transforms into a fishtail braid at the base. 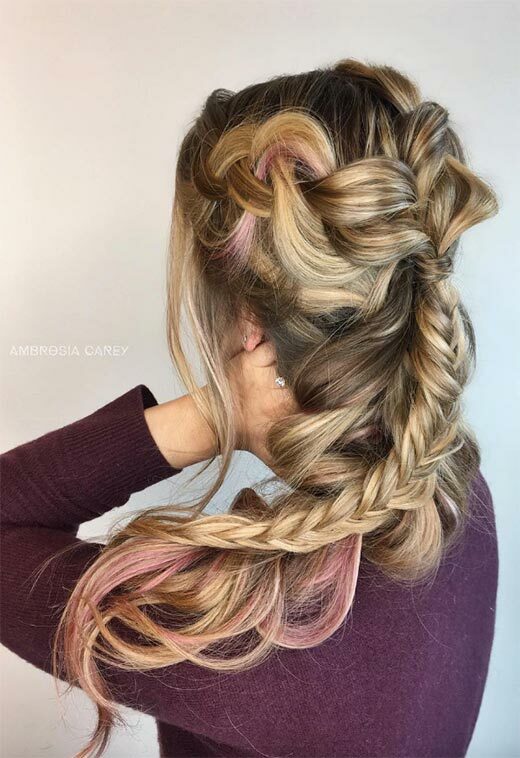 If you love playing with texture, adding a few colorful hair ties to your braided hairstyles for long hair is the way to go. Here we have a single strand, but after each tie the style of braid changes for a really fun look. Sometimes you want the braid to be a hidden accent in your long braided hairstyles. That’s when French braiding your hair from the nape of the neck up can be a fun decision. 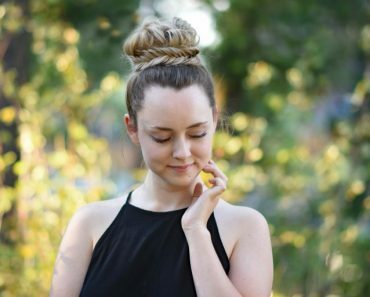 You can end it in a top bun, or like in this case, a top ponytail! Long hair braids simply beg to be beaded, like in this photo, where delicate metallic beads give a fancy feeling to this lovely accent braid. It has that slightly messy feel that makes the look effortlessly chic. 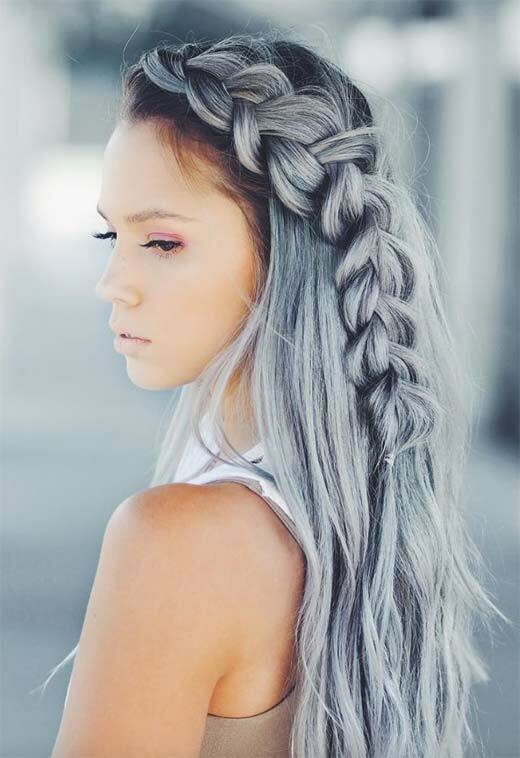 Symmetry is overrated, when you can achieve these kinds of gorgeous braids for long hair. 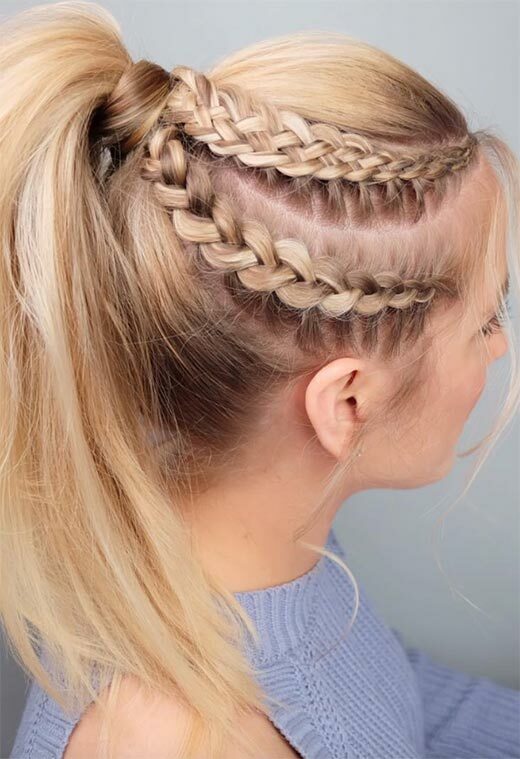 Get this look by doing a Dutch braid at the front of your head, and letting it become a braid that hangs loosely at the side of your head. Rope braids for long hair are always an interesting look. Since it’s hard to keep them in check, only having the rope braid at the side of the head and having it end in a ponytail is a great choice. There are a few fascinating things happening with this fishy long braided hair. The fishtail braid starts with two normal braids that begin at the temple, and only at the crown does the actual fishbraid start. 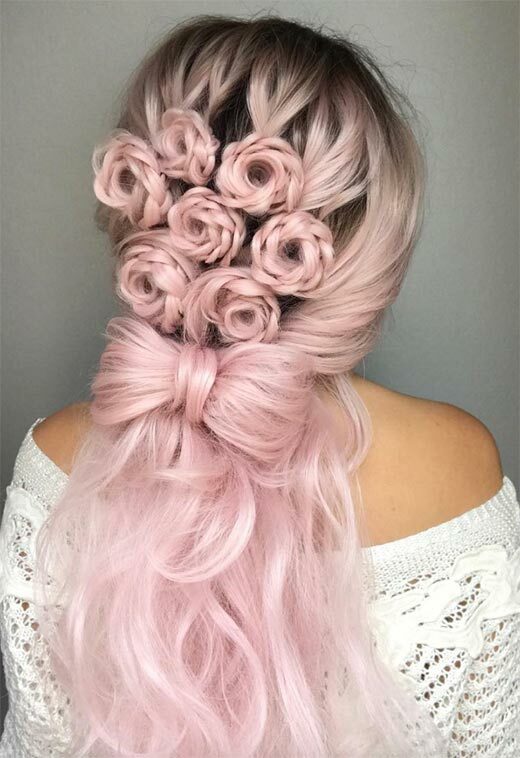 If you really want to stand out at special events this spring and summer, give this unique hairdo a try – it’s worth the effort. 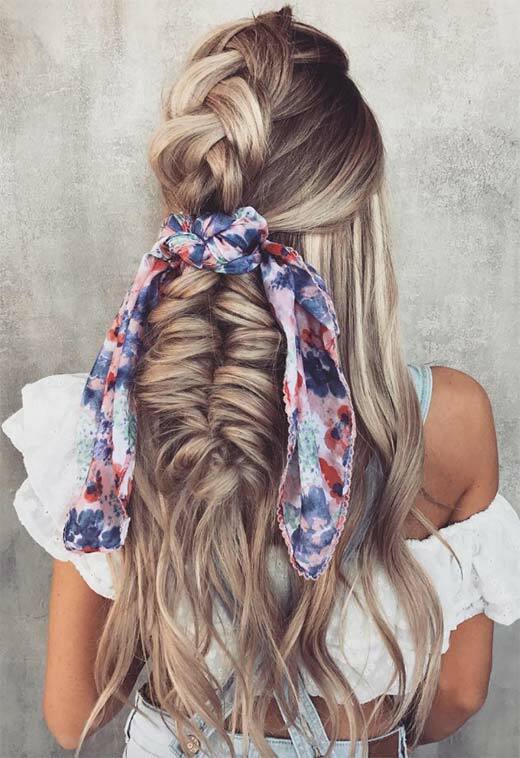 It’s made up of a bunch of little braids twisted into flowers, and is neatly tied off with a thick and voluminous hair bow. 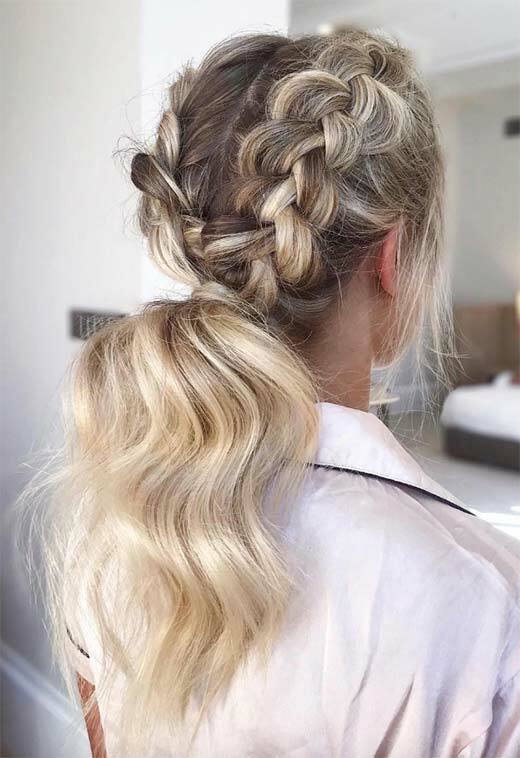 The title says it all – if your hair is massively thick, then this long braided hairdo is for you! 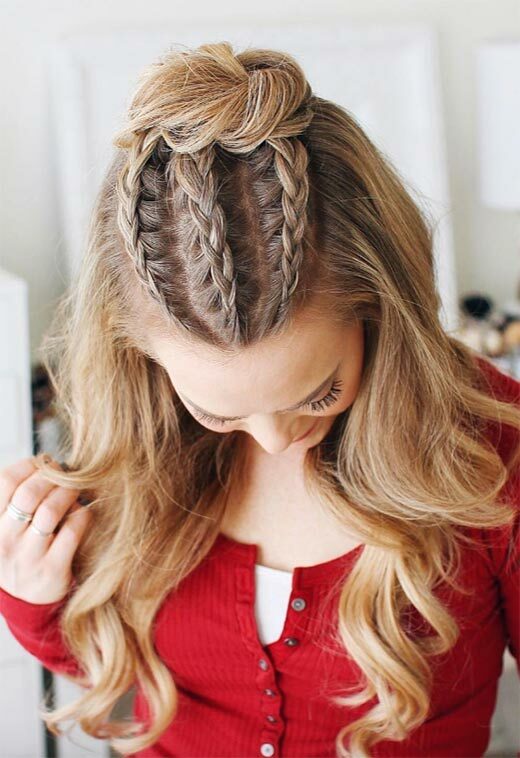 Create a loose Dutch braid that starts just above the nape of the neck, and keep everything loose for that extra volume. This romantic look features long braided hair just at the side of the head that is pulled into a lovely twisted bun. It has that beautiful swirl you’ll want to pair with gorgeous cocktail dresses for outdoor summer parties. 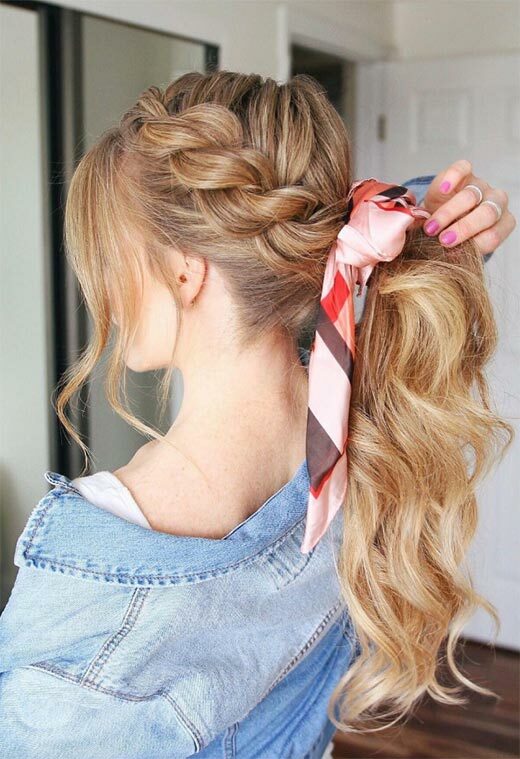 Braided hairstyles for long hair that use the braid as an accent to flowy loose hair are some of my favorites. 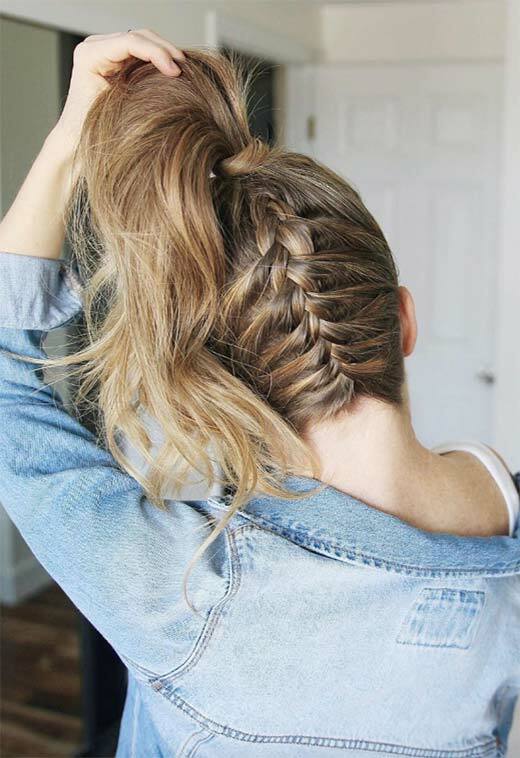 Here it’s all about a chunky Dutch braid that creates a gorgeous accent. 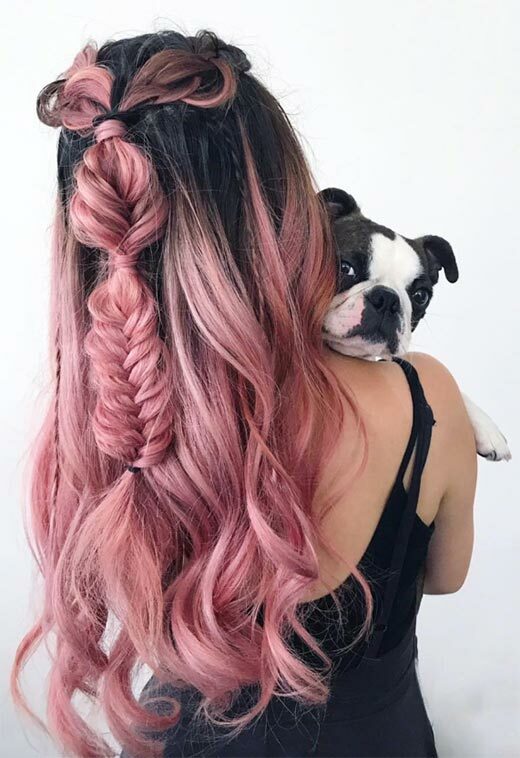 This super chunky double layering of braids for long hair is a great casual choice for those with thick hair who want to amp things up a little. It’s messy, effortles and just perfect for both day-to-day looks and special events. 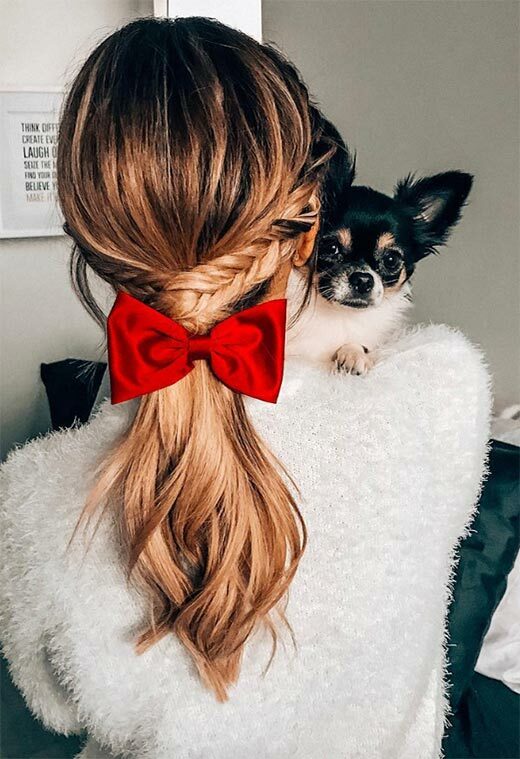 All you need for a fancy holiday look is accent long hair braids that begin right below the ears on each side, and a big red ribbon to tie things off! This will pair very well with your cozy winter sweaters, too. Are you feeling fishy? This take on braided hairstyles for long hair starts as a side French braid and ends in a textured fishtail braid that is super flattering. Another fun way of jazzing up braided hairstyles for long hair is by adding a tight five-strand accent braid along one side. It gives that special vibe to the lightly tousled medium length hair. 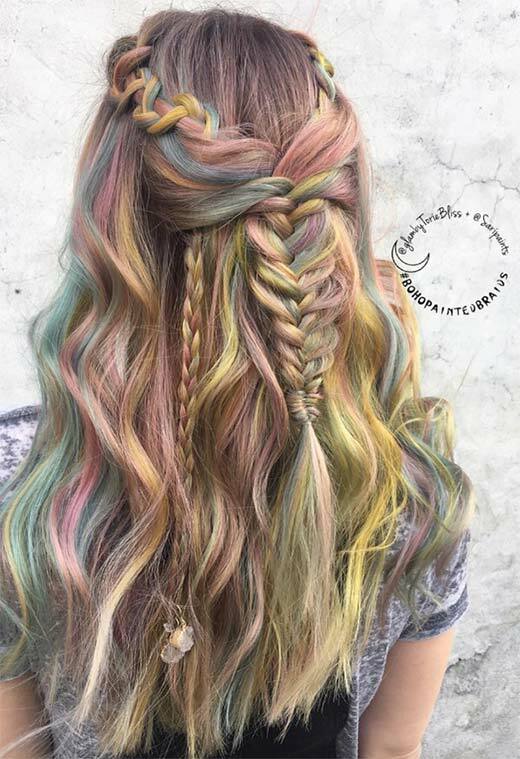 Braided hairstyles for long hair do a great job of emphasizing unique colormelts like this gorgeous pastel rainbow pearl hair. This is a complex mess of semi-braids that is perfect for casual boho festivals in the summer. 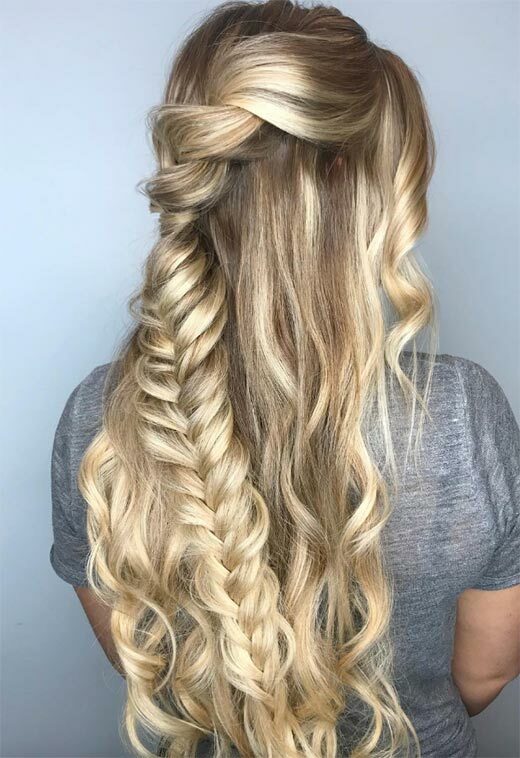 Combining two different kinds of braiding looks great in semi-updos, like this style that begins as a hair twist but transforms into a fishtail braid at the base of the neck. Keep your hair naturally textured and wavy for an effortless feel. If you simply love a high ponytail with a sporty feel, then this variation on braided hairstyles for long hair is for you. Two accent Dutch braids add interest to the super clean high ponytail in this look. 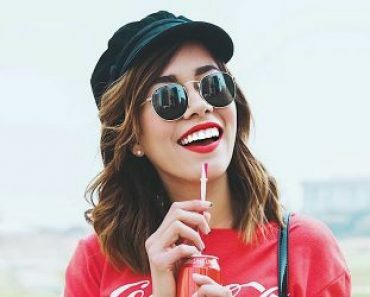 Braids for long hair certainly pair well with bangs, especially if you opt for a side Dutch braid that ends in a fishtail. 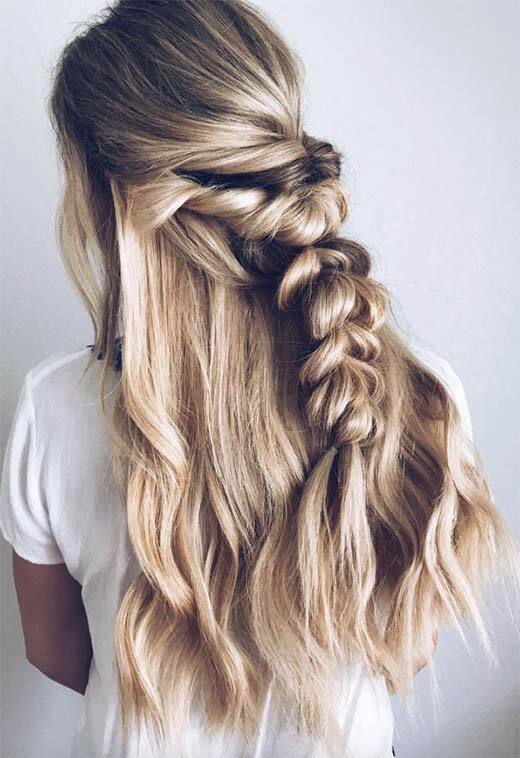 This Rapunzel braid is just ideal to pair with long flowing summer dresses. If you like your Dutch braids super tiny, then they might count as box braids. 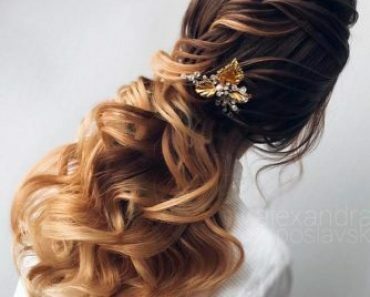 Play around by ending them in a half-up bun, leaving the rest of the hair loose and flowy. 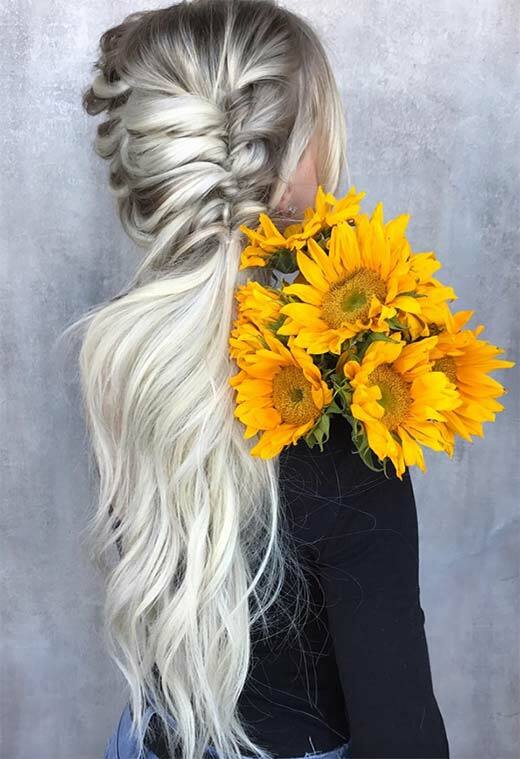 This mess of long hair braids is lush and unique, and its disorder seems ordered for a super romantic, fairytale effect. This is a long braided hairstyle for all those princesses out there that want to wow with their long locks.